For legions of lay people, the Illustrator is just a name of a banal mystical mystery, associated to an old Z-grade sci-fi movie, made with a 8mm silver film, with crapy colours and awful resolution, of which the storyline dates back to immemorial times in an unknown place. For a few “old” members, the Illustrator is a devious puzzle, almost a legend, a flash publication founded and abolished within a few months, to which TWC is indebted for some of its famous articles. 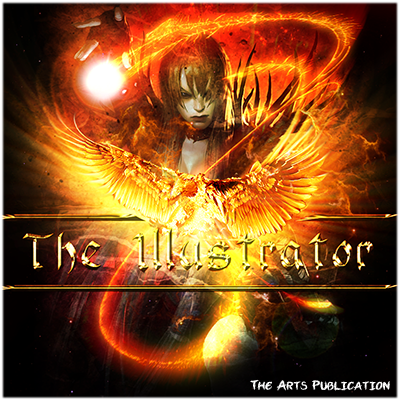 It has been a long while - 3.5 years actually - since the last edition of the Illustrator. As a phoenix, the Illustrator has risen from its ashes and is back. Those who have registered during the last 3 years might not know that publication. The Illustrator is the TWC Art's Publication. It was created in 2011 by the Art Content Staff from that time. 6 editions were published between January 2011 and October 2012. They can be found here. The purpose of that publication was originally to present the work of Artists from the Graphic Worshop. It went a lot further than that, covering the POTW and the VOTM, introducing the artistic work of a member, a tutorial and many other things. I won't hide the truth. I'm not able to reach such a quality or to promise a regular publication yet. But I hope, despite my limited skills in writting, to be able to deliver something that you'll find interesting and pleasant to read. The "man in the shadow", y2day has led the staff by the past and now he's part of the Adminitrators (Hex), more specifically concerning everything about the art side. The head of the art staff, Lifth's is trying to bring back the site on top notch on the art side. Lifth has run the graphics competitions (temporary stopped and hopefully back soon) and is fulfilling requests from regular members as well as twc staff members or as Awards Committee and moderating the Graphics Workshop forum. Soul's is better known as the Gaming Overseer (Hotseat forum). He's fulfilling requests from regular members as well as twc staff members and moderating the Graphics Workshop forum and other tasks Lifth has no time for. If you are interested to join the Content Art Staff or even just give a hand time to time, don't hesitate to PM Lifthrasir. The Graphic Workshop is the forum to navigate if you want to have a look on the work done by many artists (2D, 3D, paint, drawing, etc...) from this site. If you're an artist yourself, feel free to make your own workshop to present your work. For those who are interested in tutorials, there's a dedicated sub-forum. It still has to be reviewed and updated but we're working on it. There are tutorials about Photoshop and Gimp as resources as well. As mentioned in the intro, you can use the Sig Service/Avatar Service/Userbar Service for requests. For those who might be interested by the Graphic Workshop Competitions, feel free to post any idea/comment in the following thread. in wich you can find screenshots and videos galleries (for games) and various competitions such as the PTOW, UESW and GPOTW. We have skilled and talented artists in the Graphic Worshop. Most of them aren't well known and I think that's a shame. So for this edition, I've contacted ThatOtherGuy (TOG) who has accepted to be interviewed. I came to meet him when he showed some of his work on TWC and I've been impressed. - Hello TOG and thank you for speaking to The Illustrator. First off, could you introduce yourself to our readers? Who are you, where are you, and what do you do? Greeting everyone! My name Preston Sawyer, or as I am in the macaroni-art section of the site ThatOtherGuy. I may not have been around the block in terms of overall involvement around the site but some of you might already know me from one or two failed mod projects. I am currently living in the Amazon technocracy empire of Seattle Washington, specifically the down town area. So for most of the time I am trying to survive the current open street warfare between the hipster dictatorship of Amazon and the ancient authoritarian might of Microsoft. With that aside I spend most of my weekdays working as an intern at Victory Studios, doing postproduction/occasional 3D art for the indie web series “Band In Seattle”. You guys should check it out on youtube, it’s a fun show! 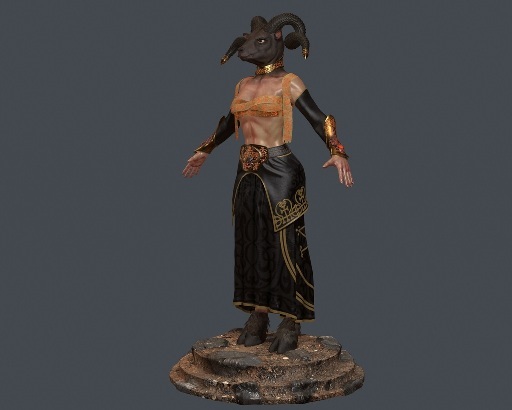 Also as of recently I am onboard to being a character artist for Ferocity Unbound’s MMO game ‘Sacrament’. - What inspired you to get into 3D art? What inspires you today? What inspired me to do not just 3D art, but art itself was probably from my desire to be creative and to make things that I wanted to make. I spent a lot of my younger years not really drawing or sculpting, but building with Legos, spending god knows how much time in my room building castles, space ships, and other various items. Seriously I would spend hours straight meretriciously putting together a set piece that was not intended to be according to the instructions, creating a freaking spaceship out of a pirate set. Eventually my time went from Legos to computer games, most notably Age of Empires and Diablo II. Through that I learned modding and then actual 3D art. It really wasn’t till 3 years ago that I actually buckled down and started to do “real art”. Funny enough when I began my education at RMCAD (Rocky Mountain College of Art and Design), my artistic skills were laughable in nearly all categories in comparison to my fellow peers. What inspires me to continue my craft is not the idea that I’m actually getting better at it, but the fact that I can make literally whatever I want with 3D applications, whether people enjoy them or not. To listen to either awesome or soothing music while creating a monster that you design is far more rewarding than the praise of critics on Artstation or Polycount for me. (However those are also nice bonuses as well). - What are your artistic ambitions? Artistic ambitions? Well I have a few things I would really like to do some time in my life: work on a RTS game based off of a homebrew setting I’m working on, make a Quake 1 inspired FPS, and eventually put that script I wrote into life via Machinima. However if all else fails I can always become a totalitarian dictator. Apparently from history that career switch went well. - Could you tell us about the software(s) you like to use, and why? The programs that I use for the majority of my stuff are Zbrush, Autodesk Maya, Photoshop, and Quixel Suite. Side programs I use are the likes of Xnormal, Topogun, Marmoset Toolbag, Knald, occasionally Mudbox, and Substance Designer. I have used Blender and let’s say I am no friend of that program. - Who are your favourite artists, traditional or digital, and can you explain why? 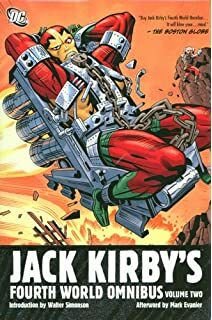 While I pay great homage and respect to the past artists of Rome and the middle ages, the few modern artists that I take great admiration are Jack Kirby, Mike Mignola, and Yoji Shinkawa. I love Kirby’s New Gods/Forth world, Mignola’s work with Hellboy, and the beautiful Metal Gear illustrations of Yoji. Also I appreciate the works of Ralph McQurarrie, Zdzislaw Beksinski, and M.C. Escher. - Where did you find the inspiration for your latest gallery entry?What's the story behind its creation? The inspiration for the latest two characters (ignoring the head bust) are based off of my homebrew fantasy setting. The setting is heavily based off of Late Antiquity with some dark age medieval and pre roman influences. 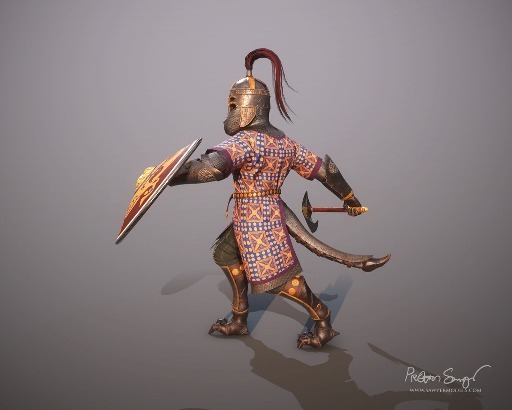 The fox-horse archer is heavily based off of Slavic, Scything, Sarmatian, and Finnish design while the scorpion warrior is based off of Sassanid/Parthia Persia. Racial design wise I wanted to stay as far away as possible from the bog standard D&D/Tolkien character that we see EVERYWHERE these days. So for archer character I wanted something rugged and wild, a race that has it’s foot in both grassy steppe and deep foreboding forests. For that I chose a wild horse and a fox/wolf. With that in mind I chose a Slavic/Scythian background, feeling that those cultures would best fit them. For the scorpion warrior I wanted a design that reflected their matriarchal culture while emulating ancient Persia. For that I chose a cross breed of a scorpion, hornet, and spider. With that done I chose the cultures of Sassanid Persia, Parthia, and a bit of India to help create a vibrant looking character. I could go on forever with the though process of these designs but I’ll leave it at this. - Did you face any difficulties, and how did you overcome them? Of course I face difficulties! Concepting and making sure your designs translate well into 3D is a challenge in of itself. But most of the difficulty arises in not what to make but how to make it. I spent a bit of time on the fur, trying my best to make it actually look as good as it does. But most of the time spent was all of the random problems that arise for nowhere, like a black spot on a texture map you baked, a model refuses to UV map itself properly, or any one of those thousand of Murphy’s Laws problems that arises. It’s the little things that make the process difficult to complete. The only solution to those problems is to use good old tenacity and patience… plus a heavy dose of swearing. - What are your plans for the future? Are there any new skills you hope to learn, or any interesting projects we should watch out for? Future plans at the moment are to find a stable job that utilizes my skills more than the internship I have, hopefully at one of the studios here in Seattle. Getting your foot in the door in the game industry in this age is a monumentally difficult task, no matter how talented you are. Other than that I’m just going to continue pushing myself and improving my art, eventually picking back up some more traditional mediums as well (drawing and painting). 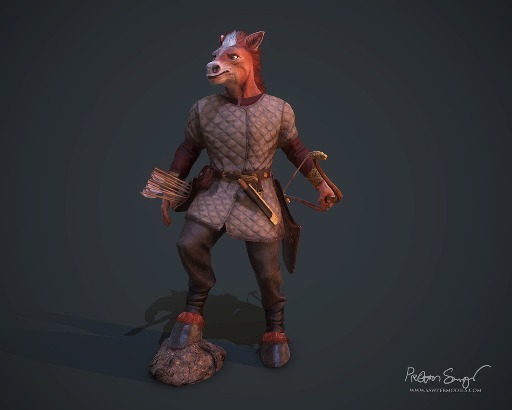 - If you could offer a key piece of advice to aspiring 3D concept artists, what would it be? 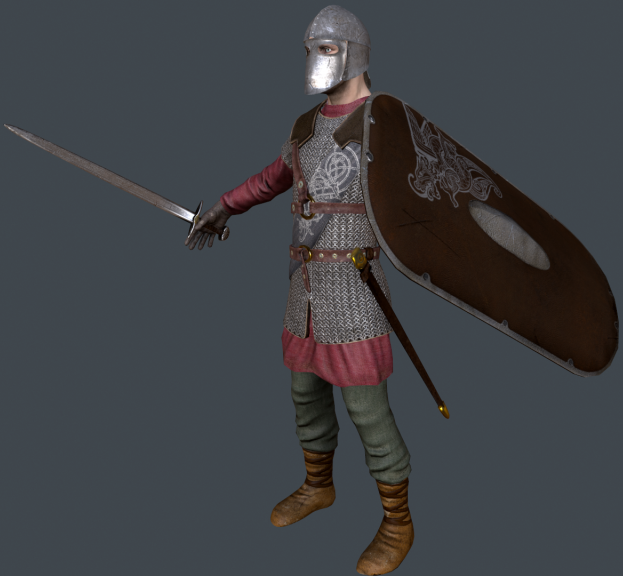 For the first year or two of doing 3D art, you are most likely going to be simply learning how software works and what it takes to accomplish certain tasks. For example, learning to do real time hair (properly) took me about a month to absolutely nail it. Even then it took me many attempts after words to make it look half way decent (and I am nowhere near master level class quality). For human anatomy it took me a year and a half to solidify the foundational understanding of anatomy. Now I am simple refining it and moving closer to more AAA realism… which will be achieved by the time of the heat death of the universe. Second is that you should never compare your chapter one to someone else’s chapter twenty. You may see amazing digital art out there but most of those master class pieces are done by people who have 7+ years of experience. Third is that some people naturally are better than you. Doesn’t mean you can’t be as good as them, it’s just that some people just learn art faster and can become pro quicker than you. Take your time at a reasonable pace and you will succeed eventually. I’m personally miles away from my own personal finish line and I have seen people younger than me produce better work. It takes time. Fourth is that while social media presence and digital presence is insanely important to connect and get a job, what it even more important are good social skills. You will not believe the amount of artists I met at GDC (Game Developer’s Conference) last year that had amazing portfolios, but spilled their spaghetti on a daily basis or had an ego to match it. Team work is key in the industry and if you are a grating person either through social awkwardness or rudeness you are not going to survive. Last, and most important, if someone tells you to make ‘badass’ art, just spit on them for a minute. And when I mean spit on them, I’m not talking about a casual spit. No, I mean a full on effort spit. Because telling someone to make badass art is the equivalent of telling someone that the sun is bright. It’s obvious. Anyways that’s my interview and hope to see you guys around soon! Dafonts.com: That site proposes downloable fonts for free, classified in alphabetic order, by type, by author ou by popularity. sebastianraposo.com: That site offers something like 1800 textures (high resolution: 5184x3456) free and royalty free.The author just asks for credit when used for projects. That's it for this time. I hope you have enjoyed it. Don't hesitate to leave your opinion in comment. That will help me to improve. Beside that, if there's any specific subject related to Art you'd like to see published in the Illustrator, don't hesitate to contact me by PM. Wow, I've been missing these! This needs a global announcement! Great issue, the interview (and the included artwork) are brilliant (and the freebies are a nice touch)! Hey thanks Lifthrasir for the interview and showing off my work! Was a pleasure participating!